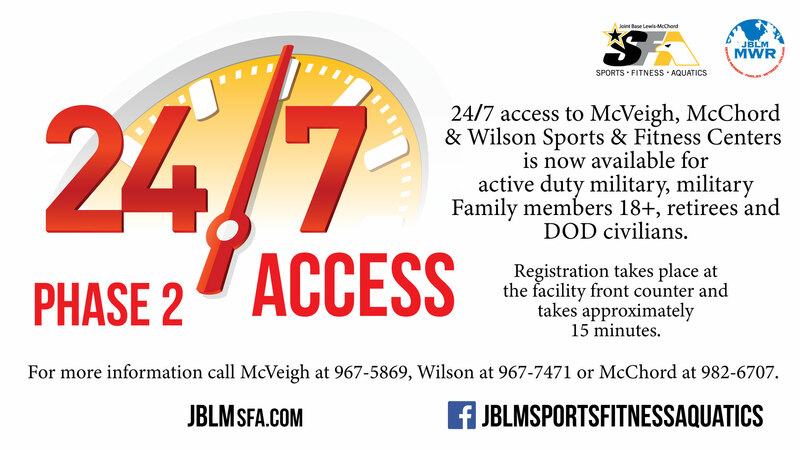 Registration for 24/7 access to McVeigh, McChord and Wilson Sports & Fitness Centers is now available for active duty military, military Families ages 18+, retirees and DOD civilians. A CAC is required for registration, if you do not have one a $5 proxy card is available for purchase here. Registration takes place at the facility front counter and takes approximately 15 minutes. For more information call McVeigh at +1(253)967-5869, Wilson at +1(253)967-7471 or McChord at +1(253)982-6707.